Jerusalem artichoke season is coming to an end (they’re still at the market in Israel – what about the rest of the world? ), so I knew I had to get this recipe up soon. 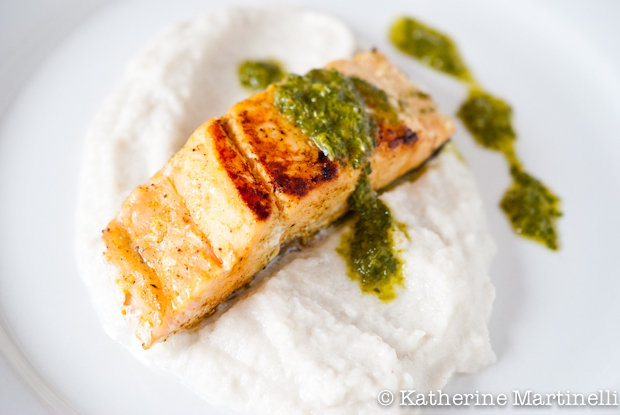 This recipe for salmon with Jerusalem artichoke puree and herb sauce is an elegant, restaurant-quality meal that’s ready in under an hour – I swear! Salmon filets are brushed with a mixture of honey, Dijon mustard and curry powder and seared. Jerusalem artichokes (i.e. sunchokes) are simmered and pureed with butter and warm cream. And, for the finishing choice cilantro and mint are blended with olive oil for a sauce full of fresh flavor.Jerusalem artichokes are not artichokes, nor do they come from Jerusalem – they’re tubers in the daisy family and actually taste like a mix between artichokes and sunflower seeds. An interesting historical tidbit care of Wikipedia: Jerusalem artichokes are actually native to the Americas and were cultivated by the Native Americans. A French explorer brought them from Cape Cod to France in 1605 and by the middle of the century they were commonplace. Indeed, I always associated them way more with France than America. When purchasing salmon try to make the most sustainable choice. Wild salmon is typically considered a more eco-friendly choice than farmed, but this article from The Daily Green posits that the distinction between fresh and frozen is actually more important – with frozen fish being the more sustainable choice since “container ships are by far the most efficient and carbon-friendly way to transport food.” Interesting. Obviously if you have access to super fresh local salmon, then go with that. I realized that while I cook salmon fairly often, I have few recipes on the blog. So here you go! What are your favorite ways to enjoy salmon? Share your recipes in the blog hop below, or tell me in the comments! 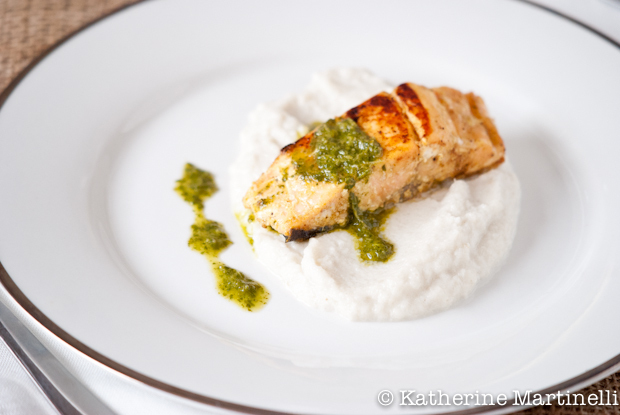 A restaurant-style meal at home in under an hour, this salmon with Jerusalem artichoke puree and herb sauce makes for an elegant but easy gluten free and kosher meal. Fill a large bowl with water and the juice of ½ lemon. Peel and roughly chop the Jerusalem artichokes and immediately put in the acidulated water to prevent from turning colors. Fill a large pot with water and add the peeled Jerusalem artichokes and garlic cloves. Bring to a simmer, then cook for about 15 minutes, or until very tender. Add the butter and blitz. Heat the cream so it is warm but not bubbling and pour half in the blender. Blend until smooth, adding the remaining cream until you get the creamy consistency you want. Season with salt and set aside. Blend the ingredients in a blender or food processor until very smooth. Set aside (can be made ahead and refrigerated for up to a few days). In a small bowl, mix together the honey, mustard and curry powder. Brush it on the fleshy side of the salmon (not the skin). Heat a drop of olive oil in a large nonstick or well-seasoned cast iron pan over medium-high heat. Spoon a portion of the Jerusalem artichoke puree in the center of each plate, then gently place a salmon filet on top. Drizzle with cilantro-mint sauce and serve. Sauteed spinach also makes a nice accompaniment. 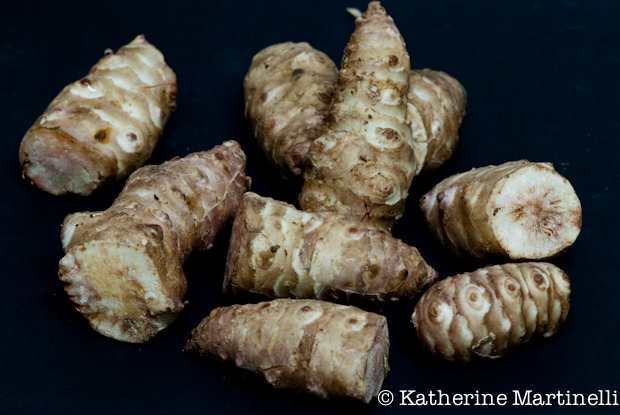 I do so adore Jerusalem artichokes, especially in soups and purees, but they are such a pain to peel! Lately, I’ve taken oven-roasting them with the skin on instead out of sheer laziness. This dish looks like it’s totally worth the effort, though. I love the bright pop of green sauce. Such a fantastic plate full of deliciousness! Definitely restaurant worthy! Have a great weekend, Katherine! Great recipe for my favorite seafood of all! HI Katherine! You selected my all-time favorite fish, salmon, that is also so incredibly healthy for us! I have shared 3 recipes and hope you enjoy each of them. I love your recipe too and especially with the addition of the artichokes! I hope that you have a great weekend and if you have time, please stop by my newly formatted blog and re-sign up for email delivery of my posts. Some people are not getting my posts due to the move and I’d hate to lose you! I have yet to try Jerusalem artichokes. Looks like a tasty combination with the salmon. I can’t wait to try this. Haven’t had Jerusalem artichokes in a very on time. Love the elegance and simplicity of this dish! beautiful dish! i love mint with salmon! Salmon is one of my favorite things to cook too, Katherine. It’s quick and delicious. I have only eaten Jerusalem artichokes in a gratin and I loved them. I need to look for some in my local shop so I can try your pureed ones. They look wonderful! Yummmm! I like salmon, but I like Jerusalem artichokes even more… which reminds me I haven;t made them in a looong time. Hopefully we’ll get them back in season soon! I absolutely love salmon and cook it all the time. Your preparation sounds delicious and that puree is gorgeous! Frozen gets a bad rap. If fish (or anything) is correctly frozen (in fish, this often means it’s cleaned and frozen at sea), it’s quality is often so far superior to “fresh.” So while I certainly do buy fresh, I know it’s always at least 3 days old by the time it reaches me. Anyway, super recipe. Jerusalem artichokes are one of those foods that I almost never cook, but should. I’ve been thinking about cooking with them lately, so I’m sure I’ll be getting around to them. Super post – thanks. I recently learned that all Alaskan fish is wild caught (not farmed) since fish farming is illegal in Alaska. That’s an interesting fact to take to the grocery store. Also, I love Jerusalem artichokes and it’s been ages since I’ve eaten them. Yum. I adore sunchokes, but have never thought about doing them in a puree. This is an elegant dish indeed. Looks fabulous! Do you still have the section on your blog to add giveaways to? I have a new one going on and was wondering if you still offered that option to your readers. Please let me know. What a marvelous dish, Katherine! Truly an elegant one. We eat quite a bit of salmon and are fortunate to have access to sustainable, fresh fish. I can’t wait to make this recipe – I really love sunchokes but have only added them to soups and stews. I love the idea of a puree! I’d really like to be a part of online community where I can get feedback from other knowledgeable individuals that share the same interest. If you have any recommendations, please let me know. Thank you! Is there a big difference if it is make with normal artichokes? A lemonade fast could possibly be an interesting and effective way to start out an appetite suppressant diet.